Payment for lodging is required in full at the time of booking. Lodging deposit is refundable, minus the cost of one night per bed reserved. We offer affordable, simple, clean overnight accommodations for climbers and skiers visiting the Estes Park and Rocky Mountain National Park region. Enjoy a hot shower and a warm, comfortable bed after a big day of climbing or skiing. Swap stories and enjoy the camaraderie of fellow outdoor enthusiasts as you cook dinner, sort gear and prepare for the next day’s adventure. Local bars and restaurants are within walking distance. 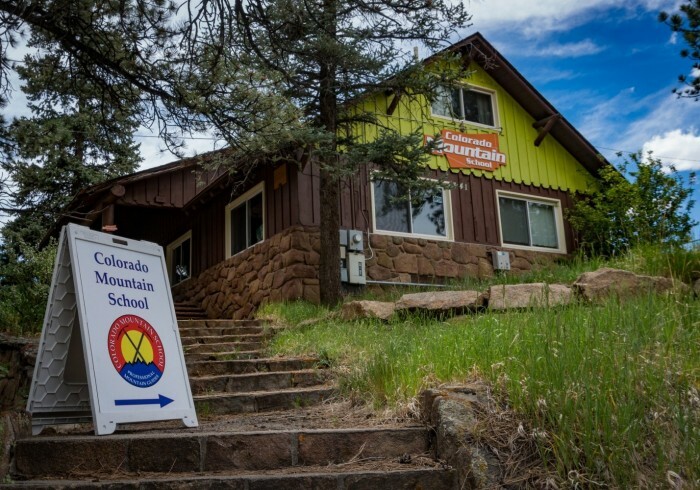 Our climber’s lodge is located at 341 Moraine Ave in downtown Estes Park, gateway to Rocky Mountain National Park and a lifetime of great climbing and skiing. We have shuttles running from our doorstep to and from Denver International Airport daily. Visit Estes Park Shuttle for more information on transportation to Estes Park. Our Lodge carries historical significance as the first National Park Service headquarters for RMNP, although the facility has been renovated several times including a major facelift to the main floor in late 2010 so you can fully enjoy your stay. Our heated bunkhouse is upstairs from our classroom and features 16 single beds in three rooms, as well as several bathrooms, hot showers, linens, a full kitchen, wifi, and a lounge with games and a ping-pong table. Spend your evening socializing with fellow climbers, and enjoy waking up in the morning with no long drive. Located only blocks from downtown Estes, you can easily walk to almost any place in town. We also own and run a professional guiding service, Colorado Mountain School. We are the largest guide service in Colorado and has more AMGA certified guides than any other guide service in the state. We have developed the most complete outdoor climbing and skiing curriculum in the United States. Often times we are running courses in our classroom inside the lodge, so you may get the opportunity to see us in action. Keep in mind that our hostel is both a guiding service and a place of hospitality.